How I finagled my way into the compound of Afghanistan's most notorious warlord. Shiberghan, Afghanistan (one day before the election)—There was no mistaking the general’s “castle.” Its pastel-colored two-storey walls and lapis cupolas shocking amidst the drabness of the surrounding neighborhood. Somewhere inside the compound was General Abdul Rashid Dostum, the most notorious of Afghanistan’s warlords. 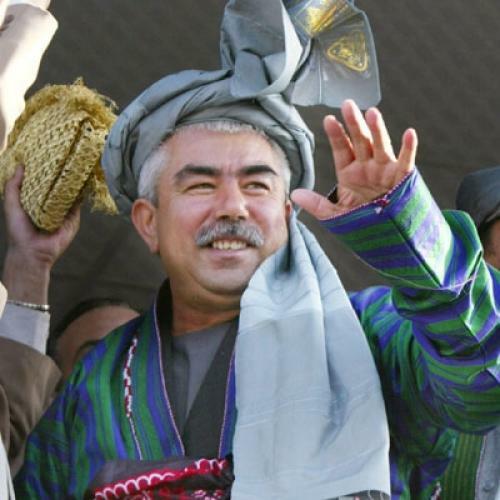 In almost three decades as a militia leader, Dostum has earned a reputation for ruthless brutality towards enemies, as well as an opportunist’s disregard for alliances, which have shifted without notice. Days earlier, he had returned from Turkey after a yearlong absence brought on by charges that he had his men beat up a powerful rival. But a last-second deal with President Karzai in exchange for his ethnic Uzbek vote bank (he claimed he’d deliver two million votes) allowed Dostum to come back, offering a vital shot in the arm for the president hours before Afghans went to vote. A band of militiamen in fatigues kept guard out front. Instead of Kalashnikov rifles, the Afghan standard, many were saddled with box-fed PKMs and rocket-propelled grenades. They looked on blankly as gaggles of men, mostly Uzbeks, filed past in shalwar kameez and fancy headdress to pay their respects. Local police kept to their side of the street, save for a traffic cop whose job was to ensure that no motorist made a potentially fatal wrong turn. Determined to come back after lunch and wait him out, I took a walk around town. The proof that this was Dostum’s turf was on the walls. A billboard depicted the mustachioed general coordinating a Northern Alliance battle plan. Another, sitting near the entrance of a school, featured the general reading a book to children. Sometimes jovial but more often dour, his image was everywhere, including above the gateway arch into the city on the road from Mazar-i-Sharif, 75 miles to the east. It was in that direction that Dostum led his forces in late 2001, taking back the territory that the Taliban had three years earlier taken from him. It was hot—it’s Afghanistan—so I ducked into an ice cream parlor. Nader Qaridyar sat next to his father counting money under a glossy poster of Dostum on his favorite white horse, Sorkhan. Stories have evolved of Dostum’s war-time exploits on horseback a la Tamerlane, the Uzbek horseman who conquered Afghanistan in the 14th century. Nader said locals loved Dostum because he was their protector. The slurs against him, he maintained, came from angry southern Pashtuns. And besides, he went on, “Just look at the life we live here compared to them.” Given the Taliban’s expanding writ there, he had a point. With time still to kill, I hailed a taxi and drove southbound out of town to Dasht-e-Leili. There, in the barren desert, the general is accused of dumping the bodies of hundreds of Taliban POWs, allegedly suffocating them in truck containers following an uprising at Qala-e-Jangi (“Fort of War”), his headquarters on the outskirts of Mazar. Rights investigators insist the mass graves exist. But the vast, sun-baked expanse hinted at nothing of what had happened. A pair of haggard camels limped around, chomping at the scrub. The general was busy when I got back to the compound. Across the street, a group of around 30 men crouched in the Afghan style—like catchers in a baseball game, elbows hung around their bent knees—under the shade of a wall. I walked over to find out where they came from and why. The men drew closer as I talked. Who will you vote for, I asked the group. “Hamid Karzai!” they shot back. Why will you vote him? “Because the general said so,” fists stabbed into the air. And are you ready to fight for the general if he asks? “Yes, we will die for Dostum,” they roared, as though trying to catch the general’s ear. A day later, moments after casting his vote for Karzai, another man deadpanned that he would jump in a well if Dostum wished. Within an hour Homayoun came to find me. After a thorough pat-down by the guards (and a check for exploding pens), I was led past the gates, where a few dozen supporters loitered. Hardly the thousands I had been promised. The general held court, draped in the green chapan, or cape,of the Uzbeks that President Karzai, as a measure of diplomacy, is never seen without. Off to the side, buttercup-shaped awnings ringed a pair of empty swimming pools, suggestive of the hasty homecoming. The general adjusted his chapan, signaling it was time to leave. I followed, not wanting to let him slip away. Rounding a corner, he stopped and faced me and, with a flourish, extended a firm hand. I’d heard Dostum was tall, but wrongly figured it was exaggerated. Homayoun, ever dutiful, said we had time for two questions. Two questions turned to 20 minutes. What kind of deal did he broker with Karzai? “The main reason I came back was concern about the fate of my people in our country. I thought if Dostum does not come back, my region, the most powerful in the country, will not take part and this would be bad for the image of Afghanistan. Personally, I’m not interested in any post.” He also said his mere presence brought security, and he recounted his past heroics against the Taliban and Al-Qaeda, while his bodyguards held flank, weapons at the ready. And then just like that, with a brisk nod and handshake, the interview ended. The general turned and walked away toward a pair of armored Toyota SUVs. But instead of climbing in, he ducked into an aqua-blue Corolla compact, a decoy vehicle, which sped off alone toward a back gate and out into the street. Jason Motlagh is a freelance multimedia journalist who covers conflicts around South Asia. This story was reported with a grant from the Pulitzer Center on Crisis Reporting. Jason Motlagh is an international reporting fellow with the Pulitzer Center. He has written for National Geographic, Outside, The Washington Post, and The Guardian. This story was reported with an immigration journalism grant from the French-American Foundation, where he is also a fellow.